Big happy family. Lucian is the baby. Random Observation/Comment #205: The less I post; the more fun I’m having. Without this me-time, I do feel a little bit claustrophobic, but at the same time, I’m usually spending it with people for a good reason. It’s not exactly what you can call “efficient,” but I feel these small social breaks are mandatory for an enjoyable lifestyle. I sound like a damn Vulcan. The last two weeks have been filled with non-stop fun in Belgium with new friends, Schliersee with nature, and the rest with Natasha. It isn’t until this 22-hour train ride from Hamburg to San Sebastian that I have time to relive the happiness. Pictures and words will not do it justice. I am grateful for those last weeks of memories with good bye parties, but saddened by the last sight of each of my acquaintances. It seems surreal that we said good-bye, but I’m happy we can now call ourselves facebook friends. This large dorm-style openness and friendliness was what I missed in my university years. I remember a few shenanigans from the Cooper dorms, but nothing compared to dinner parties thrice a week and bonding moments over a few stories and shots of exotic spirits on a regular basis. Memories of this experience (as a whole) will stay with me forever, and I hope the personality quirks each person represents can be found again in my next adventure. How quickly time has passed since I last said good-bye to Greg – the first suitemate and friend to part from this journey. After he left, there was a void in the apartment that could not be filled. There were less jagermeister shots and dancing on the tables, and I always checked out my door to see if he was sneaking a smoke on the balcony. Vadim moved in with a cheerful step, but his work made him absent to most of the usual dinner parties. There were weeks where I didn’t even think the room had an inhabitant. I considered the random knocking on the metal tube running vertically through our apartment a more frequent communicator (I know it was you, Lucian). Granted, the shoes left to fill were large, so on normal standards, Vadim was a great suitemate. I had no complaints since he left no footprint, and he was quite interesting when I had a chance to speak with him in the hall or during drinks a few times. The original roommates of the full 5 months have left a much larger impression. Leena, Anna, and Ilona have been absolutely wonderful. They each have their special part in this family and it will be difficult to find such a balanced and lively temporary home. Leena, among many things, was my laundry buddy. I find this to be one of the most important relationships because we share those moments handling clothes when they are most vulnerable – from when they’re dirty to when they’re rolled dry and to their final state of warm crispiness. I wanted this metaphor to work out better, but it just sounds naughty. Leena was hilarious in many subtle ways and I hope she knew that I caught on to all her little sarcastic jokes inserted in almost every conversation. I love her personality and fun-loving nature more than her love of disgusting black licorice candy bits (ew). The technology illiteracy also gives me a small chuckle. Answers to my tech questions like “yea… my TV is black” or “It has a blue button that lights up” or, my favorite, “my laptop’s name is Norbert” will always be treasured. PS – I’ll keep a shrine for the holy mini pineapple. Anna exudes the creativity of an architect in everything she does. I knew from the moment I met her that she had that extremely unique character. She automatically gave our apartment personality. The white walls were replaced with world maps, newspaper and magazine clippings, random cardboard things with colored cellophane taped over it, and posters of anything that could possibly look cool at an angle. The surprise of seeing a new piece on our walls every week was a good reason to come through the door. I love how she became her work and this is absolutely her passion – it’s just so obvious if you hit the right topics. When you show her something that may seem mundane, her eyes light up and she appreciates everything for this deeper, head-scratching meaning only seen by her and other architects/artists. She is modern art applied with an even spread of reality. Ilona and I shared quite an interesting silent relationship. Left alone, we might as well have communicated with charades or Pictionary. Even after 5 months, my expressive nature with German had not improved as expected. I could carry some sort of conversation, but I never found the right words to say something useful. I learned to say little phrases that could involve myself selfishly, but sometimes I just wanted a topic of interest we shared without going through a dictionary for difficult vocabulary words. Luckily, I do understand most of what she says in German and wind up responding in English. I think she understands half of what I say in English and responds in German. It’s a weird balance that only works in groups, but regardless, I love her company. Lucian, Tomas, Maria, and Natasha became the honorary roommates, as I saw them in the dining room as often as I saw everyone else I was living with. Lucian is hilarious and what I consider to be an essential ingredient to a good party. He has a clever wit and a confident stride to tell stories and experiences that draws people’s attentions. From him, I’ve learned that there should be no fear in acting silly, or a little ridiculous, sometimes because it shows you’re actually enjoying yourself, instead of second guessing your actions and being self-conscious when life should be more spontaneous. My cold and calculated nature envies such eccentric personalities. Oh yeah, and best of luck to his rapping career. Beeeeaaaches! Tomas has been the chef of the apartment (even though he doesn’t technically live there). His meals were nothing but delicious and I hope I learned something from his special mix of vegetables and sauces for salads. He continues to be updated with current events and still has time to do so much. He can drink like a fish and he’s extremely entertaining drunk. I think we had the most random dining room conversations in the past month, and I must say that it has been a pleasure. I hope he’s learned from me as much as I’ve learned from him. Maria was actually the first girl I met in Germany from the Berlin trip, and I immediately fell for that cute dimple and friendly nature. She stayed in our room for coffee and movies while she hung out with Leena, but I had always liked being with her. I feel like she was at every party and night-out I had been, even if my attendance was random and sparse. For this to occur, she probably just goes out every night to hope and see me too. I’m really sorry for not giving her a massage, and I know she probably holds a grudge about it. I’ll do my best to see her again (as with everyone else) and I promise to maintain my practice so it’s just as good (if not better). I love our hugs – it’s a great way to say hello. It’s very difficult to write about Natasha without mentioning any of our inside jokes (which are highly inappropriate). She stole my attention and time, among many other things, although I’m not complaining. I felt like these weekend trips with her have been a hazy dream of split bottles of wine in a park, and enduring long walks throughout cities, forests, and mountains. We switched roles of chef and dish washer for every meal, and I think my creativity and skill in cooking have greatly improved because of it. I think I will miss her the most – even if you sum all the other things that I’ll miss from this trip in some quantitative ranking – she will still be in the lead. Alas, I need to wake up from this dream and return to a slightly, less bright reality. Our apartment just became party central and the main place for a cup of coffee, internet usage, and a few good laughs. The refrigerators were always filled with beer and cheap champagne, and we’d always get complaints from the cleaning ladies about our large collection of empty plastic/glass bottles. 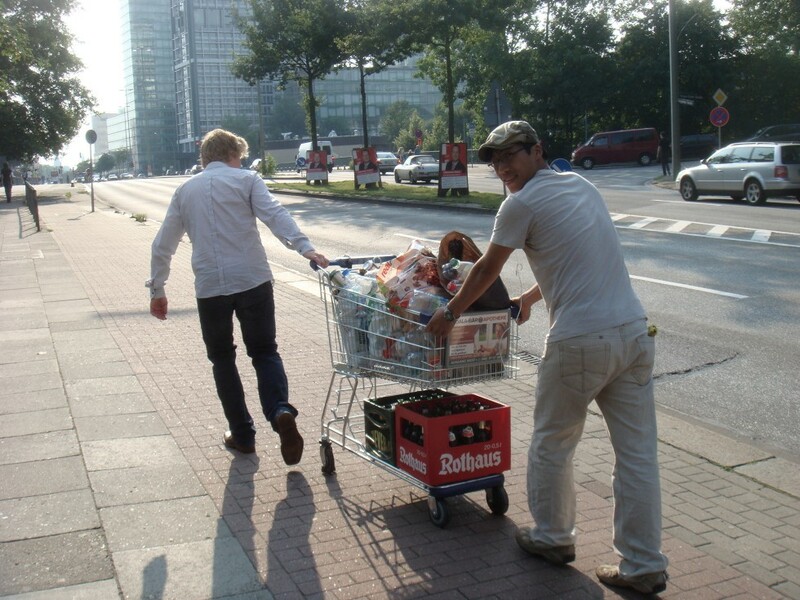 It was a monthly routine doing this homeless walk to REAL with our clanging bags dripping with month-old beer. Luckily, the money from recycling helps pay for the next party, which leads to more beer bottles (a vicious, yet amazing cycle). Sadly, I’ve left that little room. The super didn’t ask me to paint the walls or buy new furniture, but I’d be lying if I said I didn’t have to go through hoops to get this room approved. Everything seemed a bit rushed at the end to take care of all the errands, and I wish I had more time to say good-bye. The truth is: I could have extended this good-bye ceremony for another few months. In one way, I’m glad to close this chapter – I can finally reread it and smile with appreciation. I doubt it was well-written, but the stories definitely kept me turning the page. One Response to "Blessed with an Extended Family"